Newspaper accounts of Adeline Dalton's death. A comparison of Proven Sources vs. Bill Phillips' altered obituary. There is no mention in any of them of anyone named Phillips or Bea or Elizabeth! Compare the newspaper death notices below with the obituary provided by Billy Murl Phillips (aka Bill Dalton Phillips). There is no reference in any of them to any relative named Phillips or to a daughter named Bea or Elizabeth. These are all the newspaper publications that this researcher has found related to her death. There is one that resembles the (unsourced) Phillips version and that is the Kingfisher Free Press article below, but of course it makes no mention of any PHILLIPS relatives either. 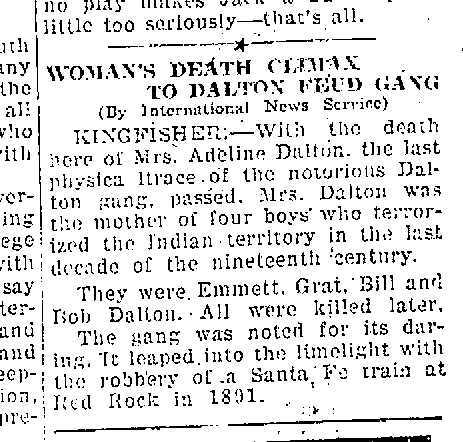 KINGFISHER: -- With the death here of Mrs. Adeline Dalton, the last physical trace of the notorious Dalton gang passed. Mrs. Dalton was the mother of four boys who terrorized the Indian territory in the last decade of the nineteenth century. They were Emmett, Grat, Bill and Bob Dalton. All were killed later. The gang was noted for its daring. It leaped into the limelight with the robbery of a Santa Fe train at Red Rock in 1891. KINGFISHER, Okla., Jan. 26. -- Mrs. Adeline Dalton, 92 years old, mother of the Dalton boys, Oklahoma bandits of the 90's, is dead at her home here. Four of the woman's nine sons were desperadoes. Emmett, Grat, Bill and Bob Dalton participated in the famous raid on Coffeyville, Kas., and the robbery of the Santa Fe train at Bed Rock, Okla., in 1891. 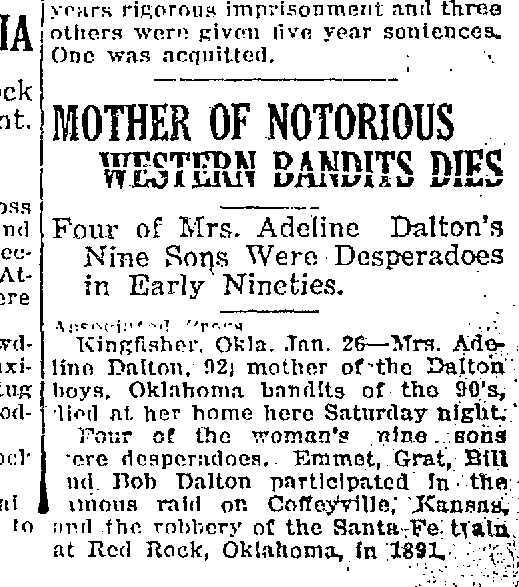 Reports reached Bartlesville Sunday of the death of Mrs. Adeline Dalton, 94, mother of the Dalton brothers, who gained nationwide notoriety in the early nineties through their raids on banks in Oklahoma and southern Kansas. Mrs. Dalton died Saturday at the home of her daughter, Miss Leoa Dalton, in Kingfisher, Okla. There were nine boys in the Dalton family. Those who became notorious as desperadoes were Bill (sic no comma) Bob, Grat and Emmett. Their first big crime was the robbery of a Santa Fe train at Red Rock in 1891. Then followed a series of robberies along the Kansas-Oklahoma border. The gang was practically wiped out in a raid on two banks in Coffeyville a year or so later when Emmett was captured and Bob and Grat were said to have been killed. Bill Dalton, who later joined the "Bill Doolan" gang, was killed in a raid on a farmhouse near Ardmore in 1894. Emmett is reported to be the proprietor of a motion picture business in Missouri. Ben Dalton, 70, the eldest of the brothers, was not identified with the gang and is a farmer near Kingfisher. The father died about 30 years ago. 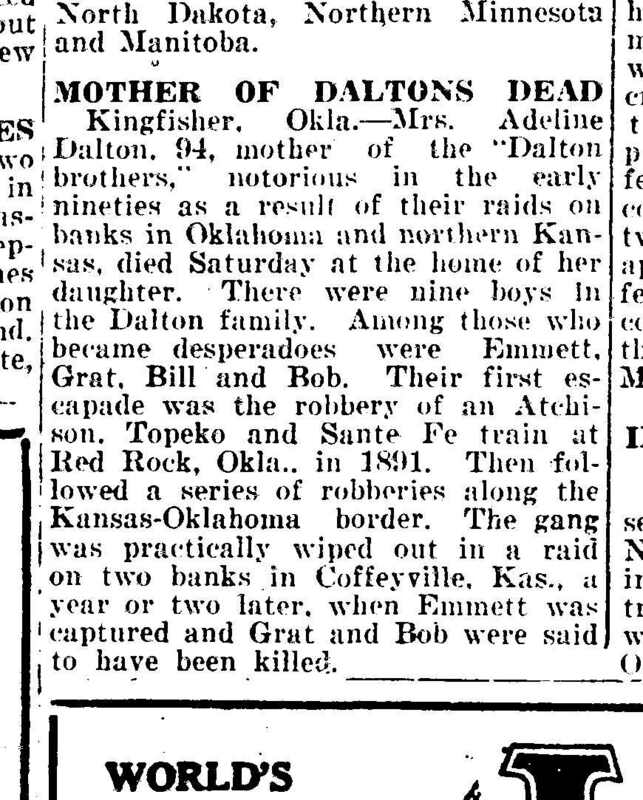 Kingfisher, Okla. -- Mrs. Adeline Dalton, 94, mother of the "Dalton brothers," notorious in the early nineties as a result of their raids on banks in Oklahoma and northern Kansas, died Saturday at the home of her daughter. There were nine boys in the Dalton family. Among those who became desperadoes were Emmett, Brat, Bill and Bob. Their first escapade was the robbery of an Atchison, Topeko and Santa Fe train at Red Rock, Okla., in 1891. Then followed a series of robberies along the Kansas-Oklahoma border. The gang was practically wiped out in a raid on two banks in Coffeyville, Kas., a year or two later, when Emmett was captured and Grat and Bob were said to have been killed. 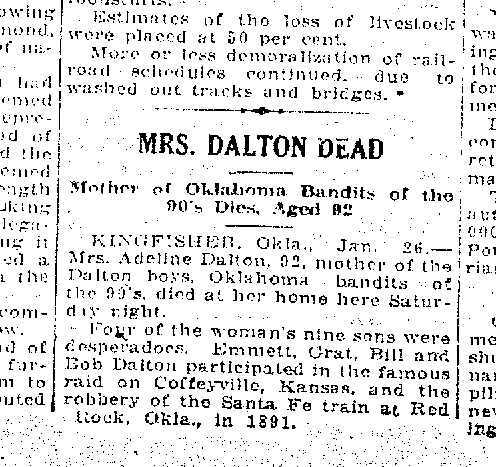 KINGFISHER, Okla., Jan. 26 -- Mrs. Adeline Dalton, 92, mother of the Dalton boys, Oklahoma bandits of the 90's, died at ther home here Saturday night. Four of the woman's nine sons were desperadoes. Emmett, Grat, Bill and Bob Dalton participated in the famous raid on Coffeyville, Kansas, and the robbery of the Santa Fe train at Red Rock, Okla., in 1891. 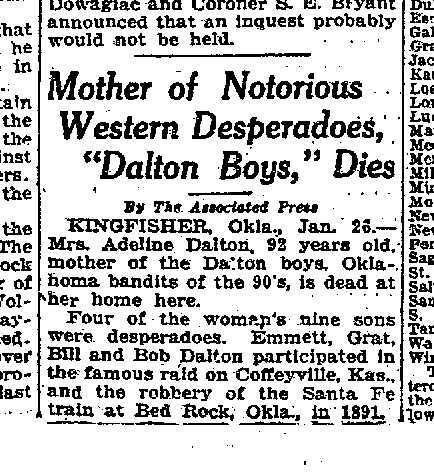 Four of Mrs. Adeline Dalton's Nine Sons Were Desperadoes in Early Nineties. Kingfisher, Okla. Jan 26 -- Mrs. Adeline Dalton, 92, mother of the Dalton boys, Oklahoma bandits of the 90's, died at her home here Saturday night. Four of the woman's nine sons were desperadoes. Emmett, Grat, Bill and Bob Dalton participated in the famous raid on Coffeyville, Kansas, and the robbery of the Santa Fe train at Red rock, Oklahoma in 1891. 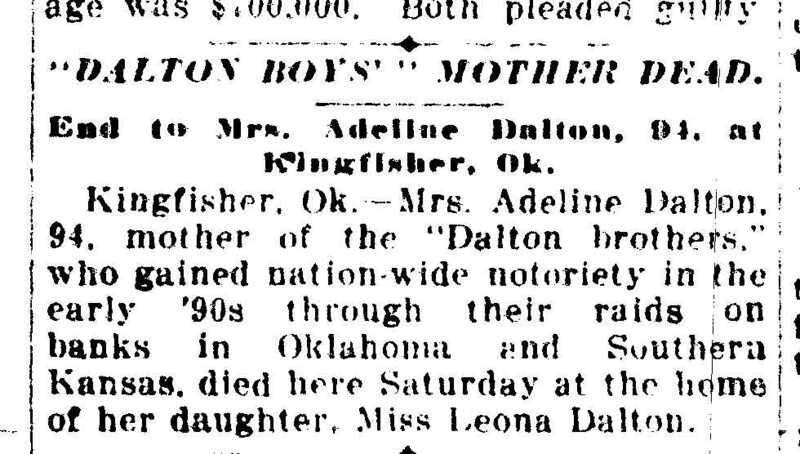 Kingfisher, Ok., Jan. 26 -- Mrs. Adeline Dalton, 92, mother of the Dalton brothers, Oklahoma bandits of the 90s, is dead at her home here. Four of her nine sons were desperadoes. She was married to James L. Dalton March 12, 1851, at Independence, Mo. In 1890 the family started to Oklahoma in a covered wagon to make their home. Mr. Dalton died July 16, 1890, from a sudden attack of cholera morbis, about a week out on their trip and was buried at Deering, Kansas. Mrs. Dalton and the family came on to Oklahoma and located on a school quarter in Cimarron township. She made the race in the "C and A" county opening and secured a claim in Cooper Township, now owned by Thomas Saunders. Mrs. Dalton joined the Presbyterian church at Belton, Mo., when a young woman and remained true to her faith to the last. She leaves to mourn their loss, six living children; Ben of Kingfisher, Littleton and Emmett, living in California; Mrs. E.D. Whipple of Siloam Springs, Ark. ; Simon of Okeemah, Okla., and Miss Leona of Kingfisher. Ben and Leona have always made their home with their mother. Ben, Simon, Mrs. Whipple and Leona and a grandson, Roy Clute, were present at the funeral. Funeral services were held at the Presbyterian church Monday morning, January 26, at 10 a.m., conducted by Rev. A.M. McInnis and all that remained mortal of Mrs. Dalton was laid to rest in Kingfisher Cemetery to await the resurrection morn. We wish to thank our many friends and neighbors for their many acts of kindness and assistance during the illness and death of our mother, and to express our appreciation to those who so kindly remembered us with flowers and other tokens. Mrs. Adeline Dalton Dies At Kingfisher at Age Of Ninety-Two Years. KINGFISHER, Jan. 24. — (Special.) — Mrs. Adeline Dalton, 92 years old, mother of the "Dalton boys," famous bandit gang of the early '90's, died here at 5 o'clock Saturday evening at the home of her daughter, Miss Leona Dalton. There were nine boys in the Dalton family. Among those who became notorious as early-day desperadoes were Emmett, Grat, Bill and Bob. The gang first attained public notice by the robbery of a Santa Fe train at Red Rock in 1891. Following this they conducted a reign of terror over Oklahoma and southern Kansas which did not end until the gang was practically wiped out in a raid on two banks in Coffeyville a year or two later. In this raid Emmett was captured, and Grat and Bob are said to have been killed. Grat was a formed (sic former ?) deputy United States Marshal. Bill Dalton joined a new gang organized by Bill Doolin, subsequent to the Coffeyville raid. He was killed by officers in a raid on a farmhouse 35 miles west of Ardmore in 1894. Emmett is reported to be still living and in the motion picture business in Missouri. Ben Dalton, 70 years old, the oldest son, was never connected with the gang, having followed the vocation of a peacable farmer in Kingfisher and vicinity nearly all his life. He still lives here. One daughter is dead and another resides in Arkansas. The father died about 30 years ago. End to Mrs. Adeline Dalton, 94, at Kingfisher, Ok.
Kingfisher, Ok. -- Mrs. Adeline Dalton, 94, mother of the "Dalton brothers," who gained nation-wide notoriety in the early 90's through their raids on banks in Oklahoma and Southern Kansas, died here Saturday at the home of her daughter, Miss Leona Dalton.